Obituary for Larry K Hoffman | Crandall Funeral Home Inc.
Our beloved husband, father and grandfather Larry K Hoffman passed away peacefully surrounded by family on April 7, 2019 in Salt Lake City, Utah. He was the sixth of seven children born to Albert L. Hoffman and Effie Hayward Hoffman. He was born and raised in Randolph, Utah working on his father’s ranch while growing up. He graduated from Rich County High School in 1953. Larry married Sharon Palmer on December 1, 1956 in Elko Nevada. They were later sealed in the Salt Lake City Temple. Mark (Iryna), Dan (Donna) both of Evanston, daughters Linda (Rick) Sanchez of Evanston and Julie (Mark) Lube of Hailey, Idaho. Twelve grandchildren: Brandon Hoffman, Shelly Adamski, Melissa Bomar, Derek Hoffman, Desi Williams, Seth Sanchez, Kory Hoffman, Andrea Sanchez, Kelsie Bardsley, Megan Lube, Bree Sanchez and Nic Lube and 7 great grandchildren. He is also survived by his brother Harold Hoffman of Randolph, Utah and many nieces and nephews. Larry is preceded in death by his parents Albert & Effie Hoffman, siblings Glen Hoffman, Elaine Call, Blaine Hoffman, Roy Hoffman and Sherlene Wamsley. Larry worked at Union Pacific Railroad in the early years as a machinist. He had a love and passion for ranching owning and operating his own in Randolph, Utah for many years while being self-employed in the Insurance Industry. In 1961 after being told that he probably wasn’t “Life Insurance Material” he proved to be a top producer for Beneficial Life Insurance Company qualifying for the next 40 years consecutively for his Company’s top awards. Larry had a passion for his work and was dedicated to his Industry for 57 years working until Friday, March 22, 2019. 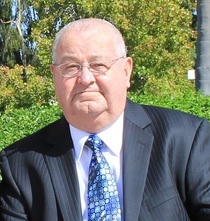 He was a member of NAIFA and a life member of the Million Dollar Round Table. Larry qualified for the prestigious award “MDRT - Court of the Table” of which he was extremely proud. At the time he was 1 of 2 people to ever qualify for this award in Wyoming. In 1990 he was voted by his peers and colleges as the “Wyoming Association of Life Underwriters Agent of the Year”. You can join the family Thursday April 11th for a visitation from 6-8pm at the Evanston Wyoming South Stake Center 632 Twin Ridge Ave and again on Friday, one hour prior to services. Funeral services will be held in his honor at 10am on Friday, April 12th also at the Evanston Wyoming South Stake Center.